If you want your caps to stand out from the rest of the merchandise on your wall, then using the Single Hat Display for grid wall is the choice to make! 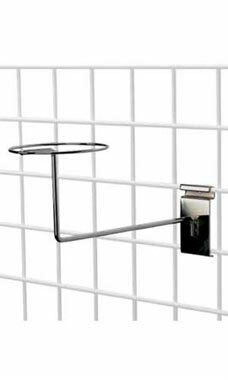 Simply attach the display hook to wire grid, and caps will stand out against other merchandise. Hang a single hat display, or line up as many as you can. Either way, you can add your own style and flair to the way you present your inventory! Foam pads are sold separately but can also be purchased from Store Supply Warehouse. Like all of our hat racks, these single hat displays are great additions to any setting. In stock and available for immediate shipment. These hat racks are the most affordable and professional way to display all your hats, from elegant formal hats to the latest trendy knit beret. ordered these before, they work great. Just wish there was an option to also purchase the same thing but ones that hold hats with larger brims. Well made and very affordable, sure is a space saver. These were nice. I ordered the wrong style, I needed slat wall not gridwall. Fortunately, my husband is handy and we were able to adapt them! No fault of company..I just ordered wrong style! works perfect on my gridwall-- great price too! Worth its price makes it a cheap way to display your hats. Works well and works even better when used with the foam hat display pads (which are really cheap)!! Great quality, SUPER FAST shipping. I literally had my order within 48hours. A+++ store! Love the hat display! A great way to display hats!! Will be ordering more!! For a more rounded effect for knitted hats, I like to add a stroform ball to this to give it a more head-like effect. Product quality was good, some of the display arms were bent. Great way to display your hats and when used with the pads make them stand out! Wonderful product. Fast shipping. Will definitely Recommend this website to others. I really like this product! This hat display rack is very functional to hang a hat and place a matching scarf on the bar directly behind the hat. This provides a matching and organized look! This product beautifully displays my hats. Many of my customers instantly took notice and gave me many great compliments. A great rack when used with the grid. I ordered several to store and display in my home my collection of newsboy caps. It could use a domed, foam hemisphere accessory to better support the caps. I love this item. My hats look so nice displayed ont eh racks this way rather than on styro heads. Now, combination of these pegs that would hold a styro head would be amazing. Worked out well for use with hats. I would like to see the foam display pads included with each one.